We fly back to the US on Thursday. Last night, we had a lovely going away party at Colin and Maggie's place. We got two lovely coffee table books on Paris (one in French, one in English) that will be lots of fun to read through and reminisce over. And, despite our original intent to say our final goodbyes, we found ourselves making plans with nearly every person at the party! So, in many ways, I didn't feel like that gathering was any different than the other ones we've had throughout the last several months. 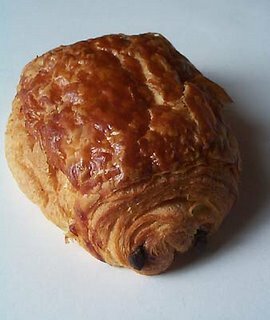 Then, I ate pain au chocolat. Now, I'm all nostalgic and moody again, realizing that I only have three full days left in the City of Light. Am I ready to go home? Yes and no. I definitely love living a carefree life in Paris, but I knew it wouldn't last forever. I guess I just didn't expect July 2006 to show up so suddenly! By this time next week, I will be living in an apartment nearly 3 times the size of where I currently am, stocking up on preservative-laden frozen foods and cursing at the gas pump. And yet, I'll have 24-hour access to cheeseburgers, dental floss, and the ever-overseas-elusive Lysol spray disinfectant. What a tradeoff! Sounds somewhat bittersweet...can't wait to have you back within arms' reach again though.